Why would seven girls from Davis, California start a chocolate company? Because it’s yummy dummy. In other words, for the sheer pleasure of it. That’s probably why they donate 100% of their profits to charities benefiting children and the environment. Who can resist that combination? 71% Cocoa is an unusual rating but I dig that they threw in the extra 1% for good measure. It’s kind of like an old-school baker’s dozen. The plain bar I sampled (actually I ate the entire thing… does that still count as sampling?) was nice, smooth and enjoyably crisp at room temperature. It’s a pretty straightforward flavor that provides balanced sweetness and a little bitterness but not the strong after taste characteristic of many single source bars. Still it’s strong enough to engage neurons in your milk proximity detection lobe so make sure you’ve got a cold glass close at hand. 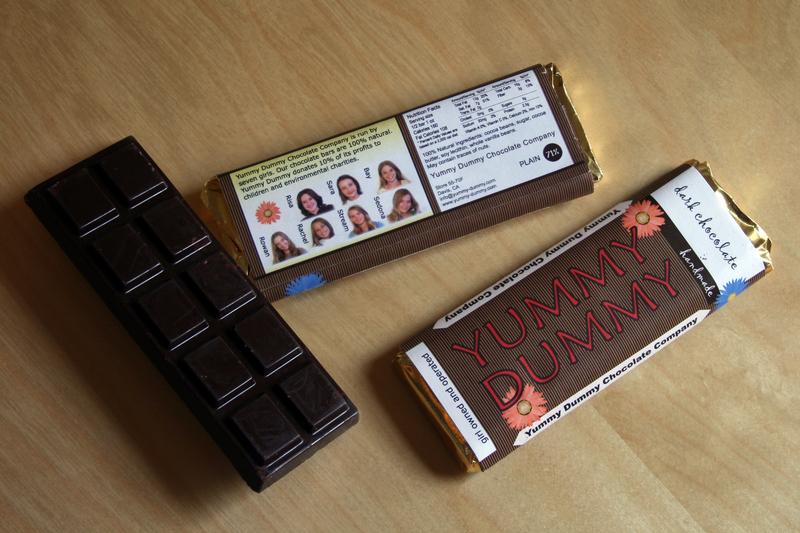 Yummy-Dummy’s website proceeds in the same spirit as their packaging – including the self-styled proverb: “Man can not live by chocolate alone, but girls can…” It’s a fun read actually and you’ll learn about things like their Nut-O-Matic machine. To get the full experience you should purchase a bar the next time you are at the Davis Farmer’s Market. If that isn’t going to be any time soon you can order bars online. oh, sweet mystery of life, at last I found you [on Todd's desk and I had a lovely bite]…yummy yummy.